Happy New Year! If you want to experience a great new year...then it starts with your spiritual decisions. 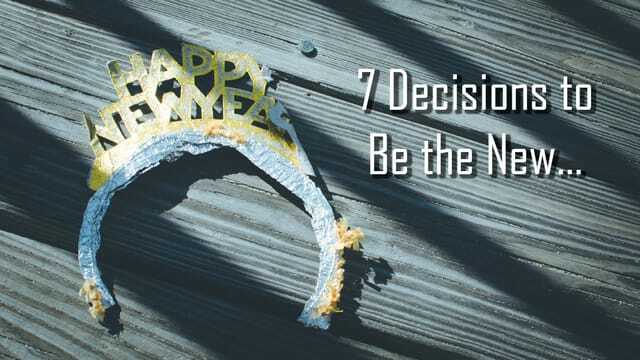 During the next seven weeks, we will look at seven spiritual decisions you can make that will make 2019 a blessed year. These seven decisions will prepare you spiritually for the unforeseen highs and lows of 2019. Make church a priority and see what God will do if you put Him first this year. It will be a blessed year! Your perception of God determines your obedience to God. How you view God determines your motivation to obey God. Am I going to strive to live a life of full obedience before God? Partial obedience is disobedience in disguise. Disobedience can make you spiritually deaf. The great trap of the devil is to convince you that your intentions are more important than your actions. As long as your intentions are good, it’s good enough. God knows your heart and He’s reasonable. Obedience to God does not include radical acts of faith that could affect your money, comfort or fears. Obedience from within is the beginning of change. If you want to live a life of obedience to God, you must utterly rely on His Holy Spirit. It’s impossible to live a life of faithfulness without His Holy Spirit empowering and enabling you.